Metal masks rule! Go team ugly! After seeing an advertisement for the new Fantastic Four story line coming up in January 2011, I got the FF itch and looked back on a few of the issues I have. 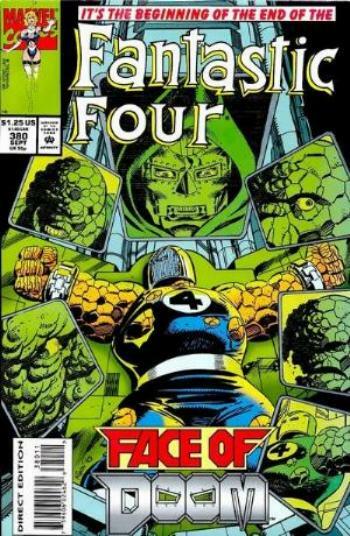 One that stood out to me was Fantastic Four #380 because of it's Thing scarred cover. Fantastic Four #380 is an issue that finds the Thing traveling to Doom's country Latveria to take out some anger on the armored villain. At this time in comic books, the Thing had recently been in battle with Wolverine and received a horrible scar across his face. The Thing took to wearing a metal mask to both hide the shame of his appearance and protect the sensitive scar from further damage. It is funny how Ben Grimm is still embarrassed of his looks after all this time living as a huge rock monster of a creature. The comic of the day gets good when Doctor Doom tells the Thing that he could fix his face if Ben simply asks for Doom's help. Doom also lives with the burden of hiding his scarred face and thought that the bond the two (Ben and Doom) shared would open up Ben to some mental manipulation. Ben laughs Doom off and eventually breaks free just as an alien breaks into Doom's castle. But that...is another part of the story that I cared little about. This era, the Thing scarred by Wolverine era, was about my favorite Fantastic Four era; however, hopefully I can get back into the crew as they face the loss of one of their four. I will be there to help pick up the slack as the other 3 try to get by. Coincidentally enough, Fantastic Four #380 is the issue before Reed Richards and Doom supposedly die (Fantastic Four #381). Fantastic Four #382 has a cover that reads "Fantastic Three." So though this new event has me curious...it's all been done be...four...or be...three. Which ever is funnier.